We share about 98 percent of our DNA with chimpanzees, our closest biological cousins. 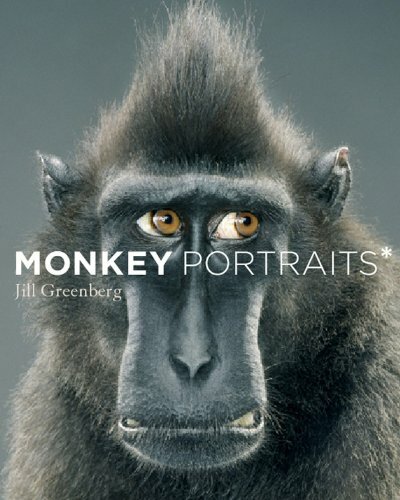 And never have the similarities between simians and humans been so amusingly and brilliantly captured as in Monkey Portraits by celebrity photographer Jill Greenberg. Jill has spent 15 years photographing everyone from Kelly Osbourne to Clint Eastwood, but has recently focused on photographing stars of a different sort. 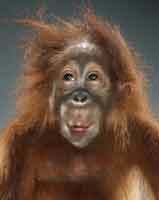 She has been photographing monkeys and apes, many of whom have appeared on movies or in television shows. Her intimate portraits of these animals convey a startling range of emotions and personalities, and evoke an almost eerie sense of recognition. Each of these 76 anthropomorphic photographs will remind you of someone you know. 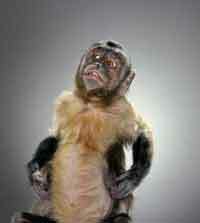 These monkeys, in all their glory, will make you laugh out loud and wonder just how different we truly are. We share about 98 percent of our DNA with chimpanzees, our closest biological cousins. And never have the similarities between simians and humans been so amusingly and brilliantly captured as in Monkey Portratis. Jill Greenberg has spent 15 years photographing celebrities--from Clint Eastwood to Drew Barrymore--for leading publications, but has recently focused on actors of a different sort. 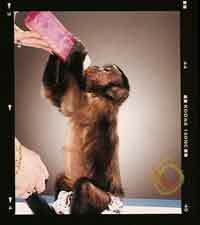 She has been photographing monkeys and apes, many of whom have appeared on film or in television shows. Her intimate portraits of these animals convey a startling range of emotions and personalities, and evoke an almost eerie sense of recognition. Each of these 76 amazingly anthropomorphic photographs will remind you of someone you know. 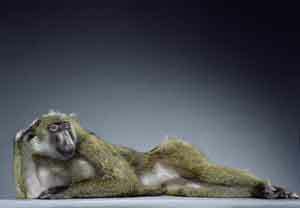 These monkeys in all their glory will cause you to laugh out loud and to wonder just how different we truly are.